Being organized — as we say in our kitchen, ‘working clean’ — is a skill to develop. We call it mise-en-place, French for, literally, ‘put in place.’ The term can be very specific, referring to ingredients needed to complete a recipe, measured out and ready to use, or it can be more general: are you organized, do you have everything you need to accomplish the task at hand? Good organization is all about setting yourself up to succeed. It means getting rid of anything that would interfere with the process of making a recipe or preparing an entire meal. On Unclutterer, we’ve written about mise en place before, but this quote got me thinking (as it did for Bauges) about how we can extend the concept beyond the kitchen. All of these items have their specific places, too, so that they’re readily available when I need them. Having once had a minor accident in a parking lot, and discovering to my horror that the insurance card in my wallet was out of date, I know how important it is to make sure I do indeed have everything in order. And I know how discombobulated I feel if I forget my water bottle, even for a short trip. But the “getting rid of things” part applies, too. It’s easier to listen to new podcasts if I’ve deleted the ones I’ve already listened to. And my car will be better prepared for future trips if I’ve made sure to remove everything that doesn’t need to be there: purchases from prior trips, the wrapper from an energy bar eaten on the last long drive, etc. If I’m making an emergency run to the doctor with a neighbor, as I did recently, I need to ensure the passenger seat and floor space are clean, not loaded with stuff that shouldn’t be in the car. Another example: Any home improvement or repair project (assembling furniture, fixing a leak, and so on) will go much easier with an appropriate mise en place. Having all the necessary tools right at hand and having a clean workspace for using them will avoid all sorts of problems. Do you use a mise en place equivalent for tasks beyond cooking? If so, please share in the comments. All Unitasker Wednesday posts are meant for entertainment — we don’t want you to buy these items, we want you to laugh at their ridiculousness. Enjoy! It’s a bittersweet announcement for us here at Unclutterer. It will be nice to have the temptation to buy clutter gone from the air travel experience. However, it also means a great source of inspiration for our Unitasker Wednesday column will vanish. SkyMall has certainly given us some great column fodder over the years: The Bug Vacuum (for those times when your shoe or your vacuum aren’t available), the Automatic Paper Towel Dispenser (a device for $99 that does exactly what the perforations on the paper towel already do), the Retro Cell Phone Handset (it even comes with a cord that can get tangled! ), and the Magic Wand Remote Control (you have to master Divination and Potions to be able to use it). 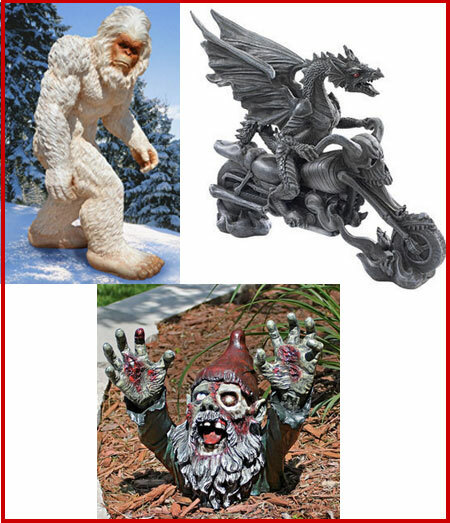 And we wonder where all of our needs for Abominable Snowman Yeti, Zombie Gnome, and Biker Dragon statuary will be met. Sigh. We should have known it couldn’t last forever. Have you seen a ridiculous SkyMall item in the past? In tribute, share your favorite in the comments. Yesterday Jacki wrote a post about five of her favorite organizing tools. Her post inspired me to look at the tools I depend on daily, and one really stood out as having very high utility: my pocket knife. I have two, in fact. One is the Swiss Victorinix Centurion, which I always take camping, fishing, and occasionally use for jobs around the house. It’s great, but a little big for day-to-day-carry. That’s why the tiny little Swiss Classic SD is the knife I love. Just today, I’ve used my knife to open a package, cut rope and string, remove tags from clothing (it sails through those annoy plastic rings! ), tighten/loosen a screw, and open letters. It’s also helpful outside the home. If you decide to buy a pocket knife, you’ll find them at nearly every outdoor store and online. There are several styles to choose from, and I’ll cover just a few here. The first distinction is a knife with a locking blade versus a slipjoint. Simply, when the blade of a lock blade knife is open, it locks open. The Centurion I own is a lock blade knife. To put the blade away, you press a little tab to release it. Meanwhile, the Classic SD has a blade that does not lock in the open position. Which should you pick? It depends on the work you’ll typically do. For light work — opening packages, envelopes, and the like — a slipjoint knife is fine. 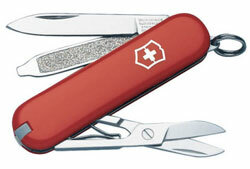 More intense work, like you might do while camping or fishing, is best done with a blade that won’t move once opened. Also consider the type of knife you might buy. I’m a big fan of multi-purpose knives, which house several blades and other tools. When I was younger, my grandfather had a pocket knife on his person all the time. I can remember seeing him produce it seemingly out of nowhere, just in time to cut some string, tighten a screw, remove a stubborn thumbtack, or what-have-you. I thought it was a magical thing, but today I realize it wasn’t magic and recognize it as a tremendously useful tool. Similar to a pocket knife, Erin has great admiration for the Leatherman MultiTool (one that flips out, not slides out) she received for her high school graduation. She also sings the praises of a good set of kitchen knives because they eliminate the need for so many larger unitaskers. Now, let’s turn it to you. What utilitarian tools — real multitaskers — do you rely on in your life? In the past 20 years, I’ve lived in eight different homes. Over this time period, I’ve come to realize there are some essential tools I have used in every home to get organized. The following are five of my favourites. Expandable half-shelves. Many homes in which we have lived did not have adjustable shelving in the kitchen cupboards. 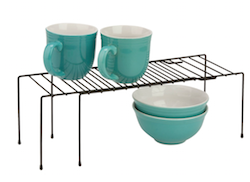 Expandable half-shelves have allowed us to store more dishes in the cupboards and be able to access them easily. 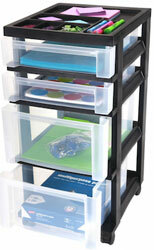 We also have used expandable half-shelves in bathroom cupboards to organize toiletries and cleaning supplies. I’ve even used a half-shelf behind my computer to save space by storing the external hard drive above the power bar. Drawer organizers. We have dozens of drawer organizers and we use them everywhere. Most of the houses in which we live have odd-sized kitchen drawers that do not fit a standard cutlery tray. We use drawer organizers to keep our cutlery in order. We also use drawer organizers in bathroom and nightstand drawers. Drawer organizers help keep our office supplies in order and we also use them in our large toolbox so we can find what we need easily. Plastic shoeboxes. I use these boxes to organize my shoes in my closet. I really like these boxes. They are transparent so I can immediately see the contents. They have tight fitting lids and they stack easily. They are useful for storing and organizing so many things beyond shoes, too. I’ve grouped all my sewing and craft supplies into these boxes so I can easily find them. We use one for our first-aid kit, one for holding our medications, and another for dental care supplies. Our electronics and gaming gear are also stored in these shoeboxes. Plastic drawer cart. We’ve lived in houses that have not had any storage space in the bathroom. These carts have been extremely useful to store hairbrushes, cosmetics, shaving supplies, and extra rolls of toilet paper. Because they are plastic, they are not susceptible to water damage like wood or metal storage units. We have used these carts in other areas of the house to organize toys, art supplies, and office supplies. They also function well in entryways to keep mittens, toques, and scarves in order. Rubbermaid 14 gallon (55L) Roughneck Tote. There are several reasons I really like this particular bin. I find it easy to carry safely even when it is quite heavy. The handles are well designed allowing for a good solid grip, my arms are a comfortable distance apart, and I can keep the tote close to my waist. We store off-season clothing, sports equipment, toys, paperwork, and holiday decorations in these totes. Another reason I like these totes is they are made from plastic that doesn’t get brittle and crack or break in cold temperatures. 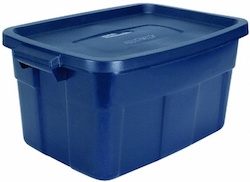 This is essential for storing items in cold Canadian attics, garages, and non-climate controlled storage units. Is following the news a waste of time? The news is (almost entirely) irrelevant to our lives. News reporting can be inaccurate, much more often than we may suspect. Follow the news on a topic you know well, and you’ll see the inaccuracies. Breaking news is especially prone to error. The news focuses on what will grab the reader or viewer, which is often the most sensationalistic stories. This can lead us to have a distorted picture of the world. The news often does a horrible job of explaining a subject with any complexity. When the Golden Gate Bridge was closing for a weekend, it was important for me to know about the closure when planning my activities for that weekend. Traffic and weather reports would also fall into this category. Sometimes a news story may inspire me to write to my legislators. This means I need to delve into the subject matter in some depth, being sure to choose reliable sources, to ensure I understand the issues. That can be time-consuming, but sometimes it feels worth the investment. The news, pursued in some depth, can also inform how I vote and how I make my charitable donations. On a more trivial level, the news may get me to see a new movie or try out a new restaurant. 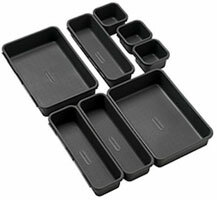 As a professional organizer, it helps me to know about things such as the new products Ikea is rolling out. Being aware a new book about organizing that’s getting a lot of attention is useful, too. I live in an area where many people work in technology, including some of my clients, friends, and family members. Therefore, it’s good for me to know about the latest industry news, at least at a high level. So I glance at the latest news about things such as Google Glass and 23andMe’s DNA analysis, to cite two recent examples. Other subjects are important to me on a more personal level. For example, I know someone who has suffered with Lyme disease, so news about the treatment of Lyme catches my attention. Sometimes I’ll read things just because they interest me. For example, I used to live in the Detroit area, and I still follow some of the news about what’s happening there. And then there are articles by favorite writers — those who both write well and are reliable sources of information. For example, I enjoy the science articles by Ed Yong. (How could I resist Here’s Looking at You, Squid?) In these cases, reading the news serves the same purpose as watching a TV show or reading a novel. Sometimes I pay attention to these stories (often at a very high level) and sometimes I just decide it’s okay to not know what’s going on. For example, about all I knew about a recent championship football game was who won, that the winner came from behind, and that the game went into overtime. When it comes to breaking stories, I try to avoid wasting time on news reports that are purely speculation. Conclusion: Looking at all this, I’m pretty satisfied with my news reading habits. Is following the news a waste of time? I don’t think so, as long as we make smart, conscious choices about what we read or watch (and the time we spend doing so). Would evaluating your news consumption be a valuable exercise? 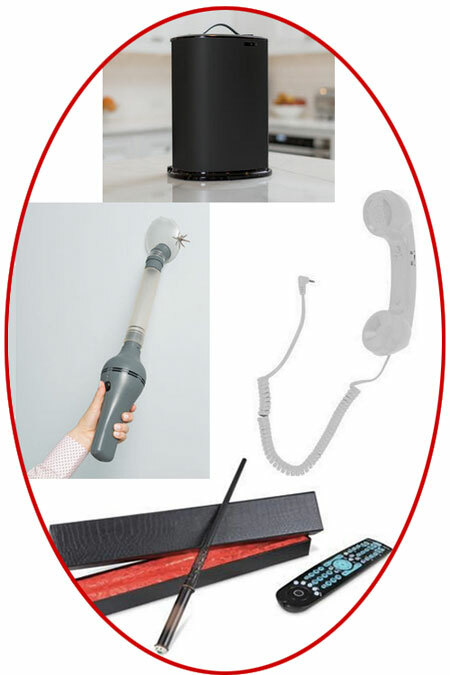 The ultra-specialization of kitchen tools is a leading cause of kitchen clutter. People buy gadgets for only one purpose thinking they have to own a tool or they’re not cooking correctly … which is rarely the case. A quality, useful kitchen tool should be able to do multiple things, and do them well. In this case, a nice pair of general purpose, long-handled, silicone-tipped tongs are essential to every kitchen and obliterate the need for waffle tongs or any other type of single-purpose tongs. This week’s unitasker has such short handles that they wouldn’t even be helpful for cooking on the stove or barbecue because you’d burn your hand getting so close to the heat source. And, since they don’t lock in a closed position, they would take up a ridiculous amount of space in your drawer. If you have a waffle iron and don’t use it often, consider checking out Will it Waffle? by Daniel Shumski. 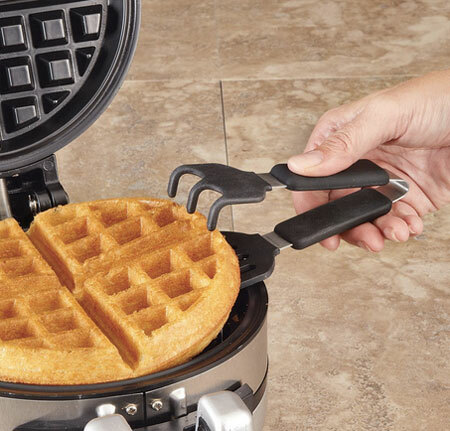 In addition to traditional waffles, you can use your waffle maker for numerous types of food and turn it into a highly functional multitasker. Thanks to reader Charles for unearthing this unitasker. Seven tips to consider prior to starting a renovation project so it runs more smoothly. Earlier this week, writer Shawn Blanc published what I thought was a rather clever post on his blog, “The Core Curriculum.” In a nutshell, the post is about gathering the insightful lessons, experiences, thoughts, and other notable moments that occur in the course of a year into a single, tidy, and easily-referenced format. I like this idea, especially since we’re only a couple weeks into 2015. The inspiration, if I’m correct, is the human tendency to forget details over time or otherwise have one’s recollections affected by environment, future experiences, and so on. This practice of capturing the details shortly after they happen not only helps ensure accuracy, it allows you to recall the initial insight after months or even years pass. I’m going to change this practice in two ways. The first is a semantic change. “Core Curriculum” has become a politically charged term, and, for that reason, I think its use here is not the best choice. Instead, I’ll use “Insights Journal.” Second, since this is a tech-related column, I’ll suggest software as the main repository, where Shawn suggests a notebook. The following is software that can help you do just that. Evernote. You might have seen this coming, as I’ve written about Evernote several times on Unclutterer. It’s my external brain, perfect for long-term storage and search. It’s compatible with almost every platform and it is actively being developed. It’s definitely a good way to capture your ideas. Day One. This program is just for Mac and iOS users, but it has a slew of fans. Day One lets you enter text, as well as photos, weather information, location tracking (if you opt for it), and more. It syncs across devices like your Mac, iPad, and iPhone via iCloud or Dropbox. You can even publish certain entries, if you prefer. Red Notebook. If you’re a Windows or Linux user and are looking for something similar to Day One, consider Red Notebook. This “modern notebook” lets you get in and start writing very quickly. You can create several virtual “notebooks,” so making a new Insight Journal at the end of the year will be easy, as will reviewing all you’ve captured. Of course, there’s always Google Documents, Microsoft Word, Apple’s Text Edit, or even a physical notebook that you could use for this purpose. Just note that, while excellent at accepting text, those options won’t offer as strong of search options for your review as Evernote, Day One, or Red Notebook. I hope Shawn’s idea inspires you, as it does me. He’s right — we do experience insightful and beneficial moments in our lives that we are quick to forget. 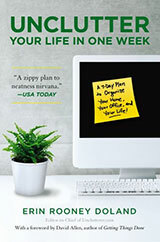 An Insights Journal is a great idea to formally capture life’s lessons for future reference. Buying a house is the biggest expense many people make. In order to keep the property’s value from depreciating, regular upkeep is important. Even if you do not own your own home, you may be required to perform specific maintenance tasks as part of your rental agreement. If you have recently moved to a new area, you may find that some tasks that you may have done in your previous home may not be applicable in the new home or may need to be done at a different time of the year. There also may be tasks you’ve never done that you now have to complete. The former owners of your home or your landlord may be able to provide you with a list of required maintenance. The staff at your local hardware store may also be able to provide you with beneficial information since they know the area and materials. Your municipality or town council will often provide details on outdoor maintenance such as maximum heights of trees and hedges and during what periods of the year these plants should be trimmed. Neighbours who have homes of similar age and design can be a valuable resource, too. For example, in one town where we lived, our neighbour told us that we needed to clear leaves and debris to ensure water would flow freely through the culvert under our driveway because if the water started to accumulate, it would cause flooding in our basement. We were very grateful for this information. It can be hard to keep track of maintenance tasks because many of them are done only once per year. Checklists can help ensure these important jobs are completed. Both Microsoft and The Art of Manliness offer thorough home maintenance checklist templates. You will probably need to modify these checklists for your climate and to suit the type of home you have. If you need to hire a professional trades person to perform specific services, such as furnace or chimney cleaning, you may find that during certain times of the year it can be almost impossible to get an appointment. Lifehacker provides a Google calendar to which you can subscribe and get reminders of what needs to be done and when. With the Google calendar, you can also add in reminders to book service personnel. Home appliances, including lawn mowers, snow blowers, barbeques, and automatic garage door openers need maintenance, too. Most instruction/warranty books for your appliances will explain routine maintenance tasks that you can add to your spreadsheet. If you do not have the instruction/warranty book you can usually download it from the manufacturer’s website. It’s also very nice to keep these maintenance records in perpetuity for reference, remembering who serviced items if you used a company and if you were happy with that service, budget planning, and to eventually pass along to the next owner of your home. Remember to include routine safety and security maintenance to your schedules. Check your smoke and carbon monoxide detectors, fire extinguishers, emergency escape ladder, and your home alarm system. Reader Steve sent us a great solution for keeping mail off his family’s kitchen counter tops and dining table. I live in Brooklyn on the top floor of a Brownstone and have NO coat closet, which is killing me this winter because our coats just end up all over the kitchen table. Do you have any ideas/suggestions for coat/hat/gloves/boot storage for a small apartment? Since it’s probably safe to assume that you don’t eventually want to end up watching the buildings around you burn while the Frank Black sings “Where Is My Mind?”, consider CB2 next time you’re about to make the drive to IKEA. The first part is a simple acrylic sign holder with magnetic tape on the back. There are many ways that you can decorate this, or if your kids are a little older, have them decorate it themselves. 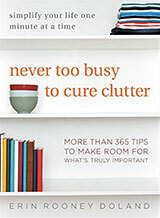 Danielle LaPorte heads helpful advice for keeping your clutter under control. Three alternatives to traditional power strips. These alleviate or reduce the space-hogging wall wart problem.